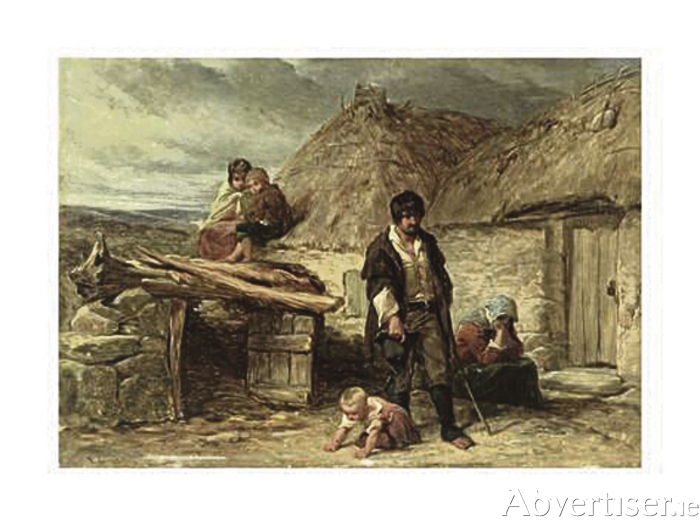 An Irish Eviction (1850) painted by Frederick Goodall, shows the uncertain future that awaited this family, and thousands of others. The children were often abandoned in workhouses, while the parents desperately sought work. The Mountbellew guardians wanted to clear the workhouse of their ‘permanent deadweight’ as quickly as possible. The savings to be had from reducing inmates were considerable, and there was pressure from ratepayers to reduce costs. Furthermore many of the girls were troublesome, arguementative, with nothing to do. They were a bad example to the rest of the inmates. It was agreed that it would be better for everyone if guardians availed of the assisted emigration schemes. The emigration schemes were well planned and organised. The Canadian authorities actively sought young female emigrants to booster their workforce, and to help rebalance the male/female population. A directive issued in 1852 outlined procedures for emigrants and recommended ‘landing money’ should be sent to emigrant agents ahead of their arrival in Canada. This was to assist in finding employment for them. Because of the demand for ships busily engaged transporting the mass exodus of emigrants across the Atlantic from Europe at this time, the guardians had great difficulty in securing transport. Eventually a Mr Gibbons, a shipping agent from Kilrush, agreed to see the girls safely across the ocean for a fee of £3/16s/6p for each girl. He further agreed to supply extra food on the journey. But even Gibbons found it difficult in securing a ship, so much so that the guardians feared Mr Gibbons was not a man of his word. Legal action was threatened before Gibbons produced a suitable ship. Eventually, on July 16 1853, the Mountbellew girls left Limerick on the Primrose, and arrived in Quebec on September 6. Although moving the girls to another country benefited the ratepayers, and improved the discipline within the workhouse, it was not necessarily the best thing for the girls. I am sure they were excited about starting a new life, as there were few prospects for remaining in Ireland. Nevertheless, they were totally unprepared for the reality that awaited them. The problem was that none of them had received sufficient training for the outside world. The situation was not so bad for males as they could find employment as agricultural labourers, or in unskilled positions. Because of the greater number of females in workhouses there was nothing for them to do. They just hung around all day, bored and frustrated. No attempt was made to educate them or prepare them for the outside world. Yet domestic service was about the only possibility opened to them, and as they struggled to find a foothole in the New World, their domestic skills were severely criticised. The matter was relieved somewhat when the Sisters of Charity opened an institution near Quebec, and took charge in training them for domestic service. Surprisingly, despite these lack of skills the Canadian authorities never put a stop to the open door policy for young women, nor did they insist on a minimum of training. Gerard Moran, on whom I am leaning for this Diary, suggests there was such a pressing need for female labour in Canada in the early 1850s, that the new arrivals were accepted no matter what their skills were, to avoid pressure being put on the Canadian economy. It was easier to encourage young girls to go and retrain them than to jeopardise economic progress. Also as the girls were young there was a better possibility of their adapting to a new life. Next Week: What DID become of the Mountbellew girls? NOTES: *They included Mary Clark from Annagh, 19 years, Mary Killarney, aged 21 from Derryglassan, Catherine Connolly, aged 20, and Biddy Barrett aged 26 years, both from Ballinakill. Jane Murray from Derryglassan and Kitty Rabbitt were both aged 18, and from Castleffrench. All the girls were young, except poor Jane Kelly from Mountbellew, and Biddy Ruane, whose ages are given at 40. Gerard Moran, whose essay in Woman and The Great Hunger (published by Quinnipiac University, USA ), from which I am taking the story today, suggests that by sending these much older women the workhouse was taking advantage of the assisted emigration scheme, and getting rid of two women who would have become permenent fixtures, and a burden.